Just as cyber permeates every other domain of warfare, the Naval Academy’s first class of cybersecurity graduates pervades every community in the service, from Navy SEALs to submariners to Marines. The class of 2015 was the first class to offer cybersecurity as a major, and 27 students graduated from the program that year. “It’s a nice bow wave, the first part of the bow wave of cyber awareness hitting the fleet and the Marine Corps,” Retired Capt. Paul Tortora told the Federal Drive with Tom Temin. Tortora said that those 27 naval officers will become indispensable to their various communities, and will help propagate a culture of cyber awareness throughout the fleet, because cyber will have an impact on every mission on the next battlefield. Ensign Zachary Dannelly, the top performing cyber student that year, agreed. He received a commission into the information warfare community as a cryptologic warfare officer. Through his work, he will defend networks and leverage offensive capabilities, although he plans to further study cyber policy in grad school. 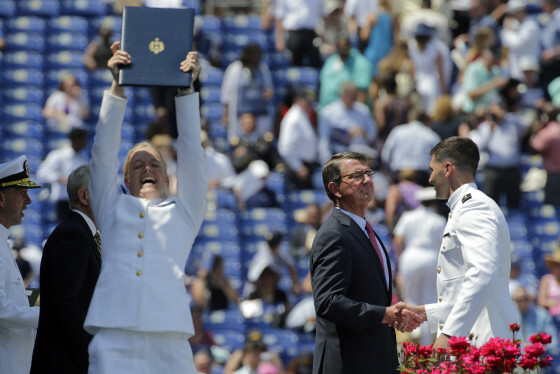 1,077 first-class midshipmen graduated from the U.S. Naval Academy in Annapolis, Maryland on May 27. Midshipmen in the cybersecurity program study technical subjects in their first couple of years, learning computer science, programming and networking. Later, they learn more about the human factor of cybersecurity, policy, and legal and ethical considerations. That is when they learn about when to use cyber techniques, the differences between national and private sector considerations, and when retaliation is appropriate. The students take a Capstone course in their senior year to tie everything together and obtain a holistic view of both offense and defense, Tortora said. Dannelly said the operational side of the cybersecurity major is why he chose it over computer science. Eventually, he hopes to pursue policy in his career, helping to make lasting doctrine that guides cyber operations in the future. Dannelly and two of his classmates attended the Cyber 9/12 student contest, a competition that challenges cyber students to develop cyber policy in response to a hypothetical 9/11-style situation. Dannelly’s team finished first for undergraduates and third overall. That qualified them to go to the international competition in Switzerland, where they placed second in the world. Tortora said that starting with the class of 2015, every student at the academy has to take two mandatory cybersecurity courses. The classes introduce students to generic hacker attacks and teach them what it looks like when a hacker is attacking the network. The U.S. officially recognized cyber as its own warfare domain with the creation of U.S. Cyber Command a few years ago, Tortorra said. NATO is currently considering following suit. “My grandfather constantly speaks about how each generation has their own fight, and he, very much my mentor, said that the digital domain would be my generation’s fight,” Dannelly said.